Find all types of places to go golfing in New York, including some of the finest New York golf resorts. See our complete list of NY golf courses. 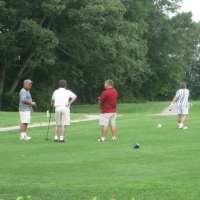 Search for country clubs and other quality venues with golf courses in NY. One of the Great Public Golf Courses in New York! A popular spot for golfing in NY, Van Cortlandt Golf Course attracts many visitors with its wildly sprawling grounds that makes you forget the teeming urban landscape outside the park's borders. 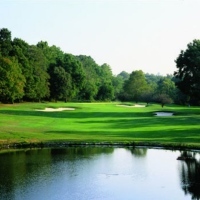 Just north of Van Cortlandt Lake, the course contains 18 holes and spans 120 acres. It remains a legendary venue, as it was the first public golf course in the U.S.! The long course is a good mix between flat and hilly holes. The scenery is beautiful with its fields, tall grasses, and colorful wildflowers. It's no wonder why Van Cortlandt Golf Course was nicknamed "The Meadows"! See why thousands of golfers flock to this sensational course every week! A Family-Friendly Golf Course in NY! 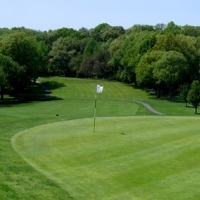 A family-friendly, 9-hole public golf course in New York--Mosholu Golf Course offers some of the finest golfing in its area! Amenities include a putting green, food and beverages, rental clubs, golf lessons and clinics, a chipping area, pull carts, and a driving range. The 2,178-yard course is great for beginning to intermediate golfers. Guests are permitted. Proper golf attire is required. For those commuting via public transportation, the course is a short subway ride from Midtown Manhattan. If you need any additional information, please contact Executive Director Barry McLaughlin at 718-655-9164 or send a fax to 718-655-9174. Year-Round Golfing in New York! An 18-hole championship course that's open to the public all year round; Marine Park Golf Course boasts panoramic water views, country club quality greens and fairways, a well-manicured driving range, and superb practice areas. On-site amenities include large chipping and putting greens with a sand trap to practice your bunker shots. At the Pro Shop you'll find affordably priced items (shoes, spikes, gloves, balls, shirts, clubs, etc.) for golfers of all skill levels. The beautiful golf course is also a popular spot for hosting wedding receptions, and other types of parties and special events. Marine Park's brand new bar and grill offers a variety of cuisines and delicious menu items, as well as a full-service bar. A Lovely Championship Golf Course in New York! 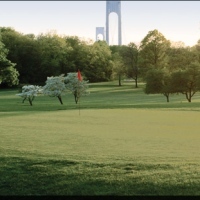 Established in 1930, Dyker Beach is a lovely 18-hole championship golf course that's located beyond the shadows of the Verrazano Narrows Bridge. Experience lush fairways and topnotch greens. Amenities include cart rentals, chipping greens, an on-site pro, a pro shop, a pull cart, putting greens, and a snack bar. The course is located near the Belt Parkway and the Brooklyn-Queens Expressway. If you're commuting via public transportation, Dyker Beach is only four blocks from the R Train Station and across the street from a Manhattan express bus stop. On the website you can book tee times up to 10 days in advance and take advantage of exclusive specials. Sign up for a Great Golfing Membership! An 18-hole golf course that's challenging from start to finish, Cherry Creek is a treat for golfers everywhere. The course is equipped with elevated tees and long generous fairways. Amenities include preferred tee times, VIP membership packages, handicap availability, custom club fitting, spacious pro shops, an all-grass driving range, women's leagues, men's clubs, large practice putting greens and chipping areas, and a full-service restaurant. Golf instruction from LPGA and PGA teaching staff is available. 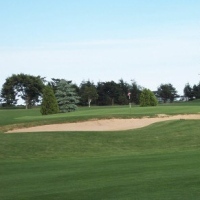 Check the website for 9-hole and 18-hole tee time rates, on weekdays and weekends. You'll also find a series of options for full season club memberships. New York Golfing for all Skill Levels! The Wind Watch Golf & Country Club in New York offers some of the most mesmerizing panoramic views you'll ever find. 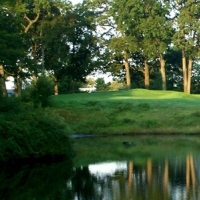 Enjoy one of the most unique and challenging golf courses in NY! The course is great for golfers of all skill levels, with its wide range of elevations and hazards. Experience NY golfing at its best with one of the most outstanding driving ranges and short game facilities. The four sets of tees range from 5,188 to 6,700 yards. The site's golfing pros offer private and group lessons, as well as clinics for all levels. You can even improve your swing and your game with video analysis. Fun Indoor Golfing in NY! A private, luxurious indoor golf facility that features PGA Tour Simulators, Golf Manhattan is a treat for New Yorkers looking to experience the fun of golfing without leaving the big city! All games are played with real clubs and balls. Bring your own equipment or use the equipment at the site. Choose from over 50 championship courses from around the world! Play within the comfort of a climate-controlled lounge, as you watch your game on a 46-inch HDTV. The venue even includes a Jacuzzi, sauna, steam room, and locker service. Also available are group and private lessons from PGA professionals. Sign up for a membership and get 2 hours of monthly play, as well as a 50% discount for additional time. A Wonderful Outdoor Driving Range in NY! 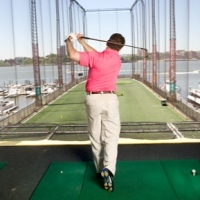 Come visit Manhattan's only multi-tiered, year-round outdoor driving range at the Golf Club at Chelsea Piers! Within the spacious facility you can hit full shots, practice putting, and receive lessons from top golfing professionals. Located on the scenic Hudson River Pier; the "super range" contains a 200-yard fairway, a full-service teaching academy, Full Swing simulators, and a membership program for frequent golfers. If you sign up for an annual membership; you receive such benefits as reservation privileges on the driving range, access to private locker rooms, and discounts on purchases. With its riverside views and country club setting, The Golf Club also serves as a wonderful backdrop for special events of all types. Rewarding New Yorkers with the ideal combination of golf and fitness, Drive 495 is a 15,000-square foot facility that serves as a private refuge for serious golfers, from novices to pros. All members are given unlimited access to the site's golf simulator, fitness facilities, golf and fitness instructors, and a relaxing bar and lounge. At the full bar you can order from a wide selection of superior wines, beers, and spirits. Use the same simulation technology that's utilized by tour champions! Drive 495's golfing instructors have competed in hundreds of professional tournaments, and have experience teaching all over the U.S. Choose from over 40 virtual courses, in all types of weather conditions! Additional amenities include wi-fi, a private screening area, concierge service, locker rooms, laundry service, and steam showers. Enjoy Golf, Batting Cages, and a Cool Beer Garden! Randall's Island Golf Center in NY is a full-service sports facility that offers golf, batting cages, golf lessons, a sports camp, parties, golf clinics, a pro shop, batting lessons, and much more! The premier outdoor golf center is a 25-acre facility that overlooks the East River. With its beautiful city views, country club setting, and cordial staff; the golf center has been a go-to destination for events of all kinds! Amenities include 82 hitting stalls on two levels, grass tees, a 320-yard grass landing area, a 36-hole mini golf course, a short game area with a bunker, a wi-fi patio lounge, and a 4,000-square-foot special events tent. Kick back at the beer garden and grill; where you can enjoy burgers, wraps, salads, wings, beer, or wine. Golf and Mini Golf in NY! As one of the many fine golf courses New York has to offer; Spring Rock Golf Center provides you with a driving range, putting green, sand trap, and an array of meeting rooms. The pro shop sells a wide variety of your favorite golfing products. 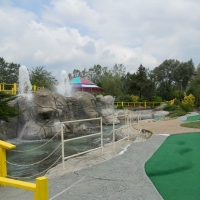 There are even two great mini golf courses that you can enjoy with the kids! Choose between the Juliet course (18 holes) and the slightly harder Romeo course (21 holes). If you're a novice or looking to hone your skills on the green, take lessons from golfing pros for affordable prices! If you get hungry, the facilities include a bakery and a snack bar. One of the Top NY Golf Courses! 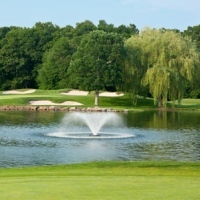 One of the top choice courses for New York City golfers, the Clearview Park Golf Course provides players of all levels with an optimum golfing experience. The 6,328-yard, 18-hole course contains a slope rating of 119. With tree-lined fairways and gently sloping greens, the course plays mostly straight. 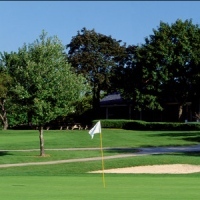 Amenities include cart rental, a pro shop, a pull cart, and rental clubs. Warm up at the brand new 8,000-square-foot putting green! Stop by the newly renovated clubhouse, complete with a bar & grill and a large meeting room. The clubhouse is the perfect spot to host business meetings or events. A Fine Golfing Spot with a Full Service Restaurant! Open to the general public, Silver Lake is an 18-hole golf course that measures 6,050 yards, with a slope rating of 108. Since the course is short and tight, it's useful for improving your game. Plus, the facilities are well-maintained and the staff is always friendly. Grab a meal at The Veranda Cafe, overlooking the golf course. The full-service American cuisine restaurant serves breakfast, lunch, and dinner. Daily specials are available and Happy Hour is from 4-6 P.M. To book a tee time reservation, you can do so online on the website. Join the mailing list to stay updated on specials and discounts. 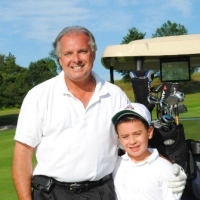 Perfect your Swing at this Quality NY Golf Course! La Tourette is a 6,692-yard golf course in NY that offers championship caliber golf at its finest. The facilities are home to the annual March of Dimes Celebrity Golf Fund Raiser. 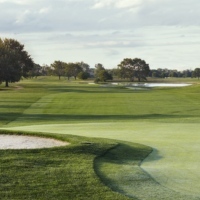 If you're looking for an ideal venue to refine your golfing skills, this is your go-to course! Warm up or perfect your swing before your round at the full-size driving range. A restored historic manor house serves as La Tourette's clubhouse. Additional amenities include power carts, an on-site pro, a full-service pro-shop, pull carts, rental clubs, a full-service snack bar, and putting greens. Conveniently located halfway between Saratoga Springs and Glens Falls, Airway Meadows houses an 18-hole championship golf course with a par 72. Always open to the public, the course is known for its mature, well-groomed conditions. 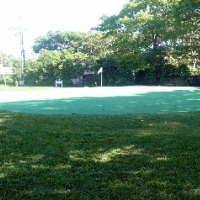 If you need to warm up, the site contains a practice green and a putting surface. Also, the driving range is easily accessible from the parking lot. Golf lessons are available from PGA teaching professionals. Stop by the pro shop to browse through a large and diverse inventory of golfing equipment and accessories. The Clubhouse Tavern offers a rustic country atmosphere, great menu items, and a full selection of liquor. One of the Most Affordable Golf Courses in NY! For reasonably priced golf on a topnotch course, tee off at Concord Crest! The 18-hole, par 71 course is beautifully designed and situated on 132 secluded acres. Experience the natural beauty of wildlife, rolling meadows, maple trees, native grasses, untampered wetlands, and a babbling brook. The course opened in 2001 and remains a favorite amongst beginning and expert golfers. Warm up your golfing skills at the 3-hole practice facility. Satiate your appetite at Concord's wonderful snack bar. The pro shop is always stocked with a fine selection of golf balls, hats, golf shoes, and other important golfing accessories. As one of the most affordable New York State golf courses, the rates remain the same 7 days a week (no separate rates for weekends, weekdays, and holidays). If you'd like to request a tee time, you may do so online on the website.